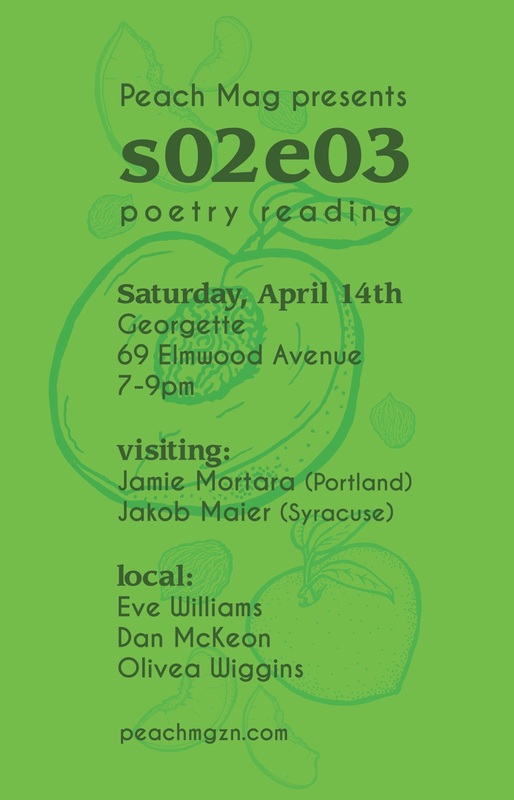 Peach Mag is proud to present visiting poets Jamie Mortara and Jakob Maier alongside Buffalo poets Eve Williams, Dan McKeon, and Olivea Wiggins for a reading on Saturday, April 14th, at Georgette. The event is the third installment in Peach’s EPISODES reading series, and is free and open to the public, with doors opening at 7pm and readings to begin at 7:30. Portland, OR-based Jamie Mortara is coming to Buffalo as a stop on their tour in celebration of the publication of their second full-length collection of poetry, Good Morning America I Am Hungry and on Fire (YesYes Books, 2018). Mortara is also the founding editor of Voicemail Poems, a journal of audio poetry. Visiting with Mortara is Jakob Maier, who will be coming from Syracuse, NY, where he is currently an MFA candidate at Syracuse University. Maier is the author of the chapbook Conversations, released last summer by Ghost City Press, a press that is beloved by many Buffalo poets and home to chapbooks and collections of much of their work. Accompanying Mortara and Maier are local poets Eve Williams, Dan McKeon, and Olivea Wiggins. Williams, a 2017 Sustainable Arts Foundation Awardee and a powerhouse in Buffalo’s slam scene, is the face and voice of Unfiltered, a Facebook page where she publishes all of her spoken word work. McKeon is the author of The Neighborhood, a chapbook of poems produced by the local publishing collective, CWP Press. Wiggins is a Buffalo-born and -bred poet and is currently a student at Buffalo State College.